As the summer term begins, it is time to enjoy summer reading. Webster University Book Club is taking on a “subtly devastating novella*” for our July selection. 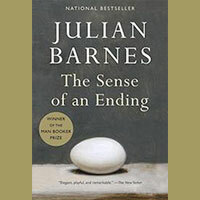 Join us Monday, July 18, at noon in the Library Conference Room as we discuss Julian Barnes' The Sense of an Ending. Everyone is welcome. Winner of numerous awards including the 2011 Man Booker Prize, the book follows middle-aged Tony Webster as his life is shaken when he must revisit some events from his youth. *Read the full Kirkus Review here.